Using it is simple. You can move around the file with the arrow keys, Page Up (PgUp) and Page Down (PgDn) keys, or the mouse. Opening a new file is done from the File->Open menu, and you can spell-check your file with the Tools->Spelling... menu option. At the bottom of the window is some useful information (if you don't see it, the Settings->Show Statusbar menu option brings it up). The line and column display shows the current position of the cursor. The "INS" means that you are in insert mode, and that if there is text to the right of the cursor, it is pushed over as you type. The opposite of this is "OVR", which stands for overtype mode, where text to the right is replaced by the newly typed text. You can switch between these with the Insert key on the keyboard. If you make any changes to the current file, then "[modified]" appears in the title bar to remind you that you need to save changes before exiting. While KEdit is useful, it is quite limited. KDE offers other options that are worth investigating. KWrite is very similar-looking, but offers useful additional features. The most obvious advantage is syntax highlighting. For shell scripts, programs, and many other types of files, KWrite colors the text to make it easier to figure out what is going on. 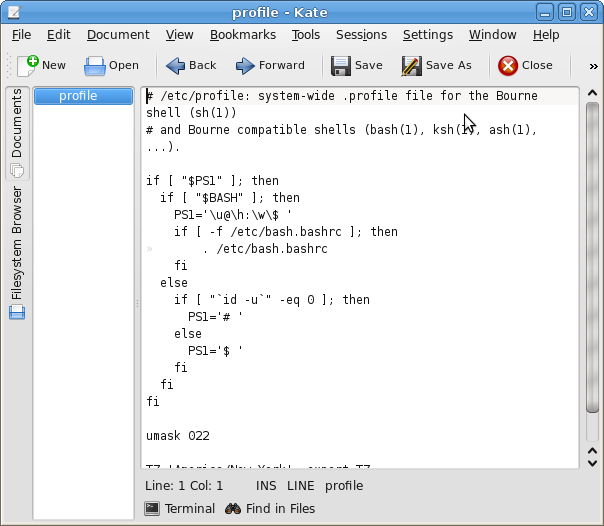 Here, comments are shown in gray, parameters are in green, built-in bash commands are shown in dark purple, and other shell commands in light purple. Generally KWrite tries to pick highlighting based on what it guesses the type of file to be. If it guesses wrongly, or doesn't do highlighting at all, you can manually choose an option under Tools->Highlighting. You might have also noticed the little minus symbols and lines in the left margin. This is part of what is known as code folding. KWrite tries to match up "if" statements with the corresponding "fi", "for" with "done", and so on. Clicking on the minus symbol collapses the block, which can be useful if you are reading through a script and are interested in viewing what comes before and after a block, but not what's inside it. There are many more helpful features that KWrite offers--take a look around the menu and see what things do! Last up in this overview is Kate. It is essentially the same editor as KWrite. However, it offers additional tools that make working on a project, as opposed to a single file, easier. On the left side of the window are tabs that let you view the documents open in the current Kate session (KEdit and KWrite open multiple files in separate windows, while Kate can open them all in one), or navigate through your computer's filesystem to open a file. Kate also does syntax highlighting like KWrite, but also adds a "Terminal" tab at the bottom. Clicking on this tab opens and closes a mini-terminal where you can enter commands. In this case, if we wanted to see what "id -u" in the script does, and can simply type it in to the terminal to try it out. 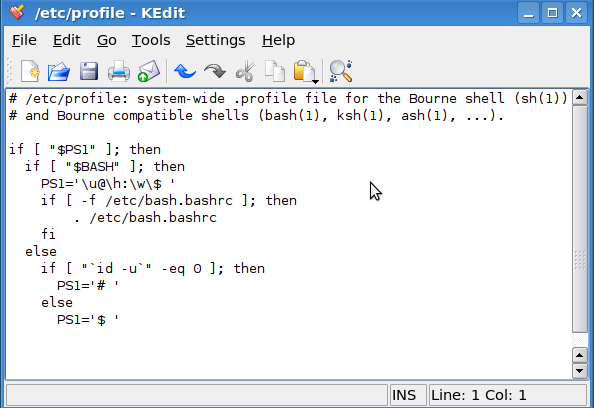 For KDE users, KEdit, KWrite, and Kate offer three nice choices for editing text files. Chances are that all three came pre-installed on any system with KDE. Have fun trying them out!